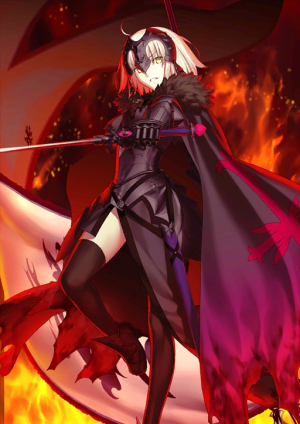 This article is for 5★ , Jeanne d'Arc (Alter). For 5★ , see Jeanne d'Arc, for 4★ , see Jeanne d'Arc Alter Santa Lily or for 4★ , see Jeanne d'Arc (Berserker Alter). Decrease other allies' Debuff Resist by 8%. Increase your NP Gauge gained when hit by 18%. 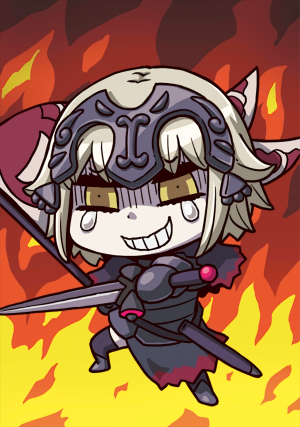 When equipped on Jeanne d'Arc (Alter), increases party's Buster performance by 15% while she is on the field. "If there is a God, surely I will be punished for this." One of the few members of the special Avenger Class. 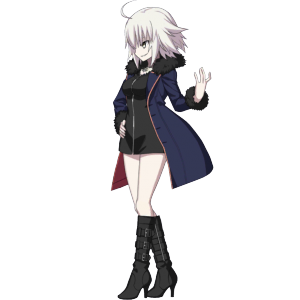 Although she is called "Alter," she is not the alternative side of Jeanne d'Arc. Rather, she is the reflection of Gilles de Rais' sorrow over Jeanne's death and a being created by the Holy Grail. As a Heroic Spirit completely opposite to Jeanne d'Arc, she materializes in this world as Avenger. Since the original Jeanne was not a hero but a saint, it's impossible to summon her "alternative side." This dark saint's core was mixed with Gilles de Rais' anger, prejudice, and twisted wish of how his holy maiden should behave. As a result, this impossible side of Jeanne was created. The Dragon Witch who swore vengeance on France. 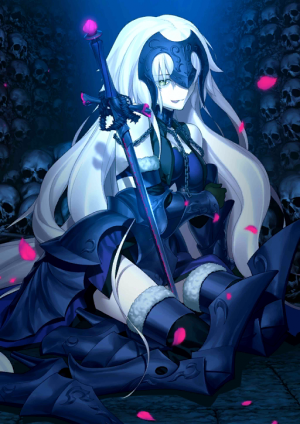 Perhaps this is the ideal holy maiden for Gilles de Rais - one who despises people's hypocritical words of justice, and hates the fools who blindly follow those words. She was created by a certain man's wish, and has the power to command over dragons. Perhaps this is the inverse result of the legends of dragon-slaying saints like Martha and Saint Georgios. 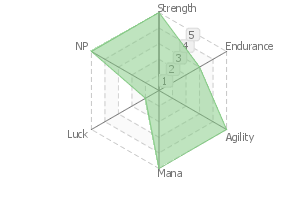 She posseses a special kind of Charisma, one that can make dragons obey and increases overall party's ATK. The cursed flag held by Jeanne, who descends as the dragon witch. In the name of the Avenger, she converts her and surrounding area's hatred into magical energy, igniting her enemy's injustice, corruption, and hypocrisy to burn them to the marrow of their bones. 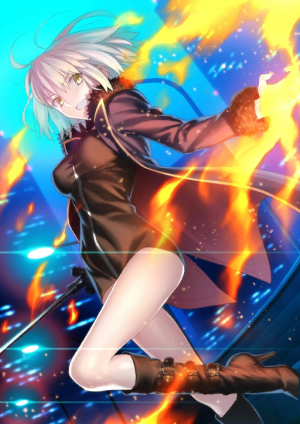 「To think that, in the depths of her consciousness, she wants to perform a strained avenge trade while being surrounded by handsome men of her own liking!」 - such is the comment from a Servant of the same Avenger Class. Since the proper Jeanne is not a hero, but a holy maiden, the possibility of 「summoning a different side of her」 is nil. 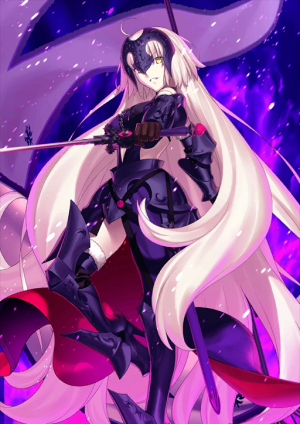 Because this black Jeanne has Gilles de Rais' anger... prejudices and wishes for her to be like that... mixed in her fundamental parts, a 「side」 that should never happen ended up being brought to the surface. A dragon witch that takes revenge on France. 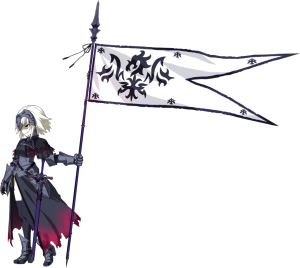 A holy maiden who talks about justice as if she owned the place and, without having any doubts about that, is spurred on by the wrath against the people; that is the form which Gilles de Rais wished her to be like. Having been produced by Gilles' wishes, she possesses from birth the power of the dragon kind. Believed to be an inverse phenomenon from Saints possessing anecdotes of dispersing the dragon kind, such as Martha or maybe Saint George. Possesses a unique Charisma that makes dragons obey her, and a power that raises the attack power of the party. 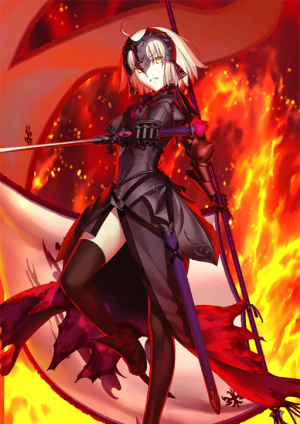 Jeanne d'Arc (Alter) was previously a 4★ Ruler-type enemy-only Servant in the game's code with a maximum ATK of 9804 and HP of 11137 respectively before the Da Vinci and the 7 Counterfeit Heroic Spirits event. She shares the exact HP values (at maximum) with Altria Pendragon (Lancer Alter). 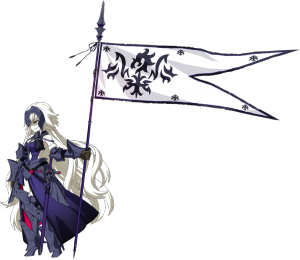 The name of Jeanne d'Arc (Alter)'s Noble Phantasm, La Grondement Du Haine, is actually incorrect French. Nouns have genders in French and Grondement is masculine and Haine is feminine; the correct phrase would be Le Grondement De La Haine. This page was last modified on 25 February 2019, at 01:40.